The most mysterious of the Gung-Ho Guns. His portrayal in both the anime and manga are drastically different. In the anime, Zazie uses the identity of a young boy named "Beeb" as a disguise. He can control sand-worms with a high-frequency device he wears on his head. The anime never exactly gives a clear explanation as to what Zazie was. It can be theorized that Zazie was a malevolent entity that took control of the boy whenever it needed to, that he was in fact a much older man who only looked like a young boy, or that he was actually a child assassin driven to the brink of insanity by his association with the Guns. his body is controlled by a collective of group-minded insects. These insects are the original inhabitants of the planet Gunsmoke and have formed an alliance with Knives to see whether humans or Plants are better to co-exist with. The insects that form Zazie also seem to represent the planet's consciousness, as represented by the sandworms he can control as well (Zazie has been referred to as the 'leader of the sandworms' by Knives). His body is destroyed by Hoppered for spying on him and Midvalley. Zazie later reappears in the body of a teenage girl. In Trigun Maximum 11 this body is destroyed as well after trying to implant an insect in Knives to control him. 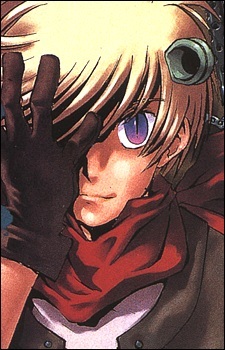 Zazie reappears one last time as an odd-looking man in disco-clothing in order to deliver his coin to Vash. It is revealed that these bodies are human, but are controlled by a small worm-like creature that lives inside it, similar to the one Zazie tried to implant in Knives. When the hive is destroyed by Knives, the man spits out the creature and has no memories of his time as host to Zazie. His Gung-Ho Gun number is 12 in the manga, and 4 in the anime.